It’s November 1, which means that thousands of writers around the world are throwing themselves into the month-long writing marathon known as National Novel Writing Month, or NaNoWriMo. This group of participants — improbable as it might seem — include people with children, people with jobs, and people with far too many other commitments to even consider doing such a thing. They do it anyway. This project has given birth to several New York Times bestsellers, so it’s not just an exercise in frustration. Although it may certainly be that too, as evidenced by a perusal of Instagram photos from Day 1 (a few highlights seen below). Blocked or not, nothing cures procrastination like a massive deadline and public accountability, both of which NaNoWriMo provides, if you so choose. Word snatching! #nanowrimo day 1. If on November 1 you hear furious keyboard pounding echoing around the world, fear not. It is the sound of more than 250,000 people beginning a literary challenge of epic proportions: 30 days, 50,000 words, and one original novel. Why? Because November is National Novel Writing Month, or NaNoWriMo, the world’s largest writing event and nonprofit literary crusade. Participants pledge to write 50,000 words in a month, starting from scratch and reaching “The End” by November 30. There are no judges, no prizes, and entries are deleted from the server before anyone even reads them. “NaNoWriMo is the writing world’s version of a marathon,” said Grant Faulkner, executive director of National Novel Writing Month. “Writers exit the month with more than a novel; they’ve experienced a transformative creative journey.” More than 650 regional volunteers in more than 60 countries will hold write-ins, hosting writers in coffee shops, bookstores, and libraries. Write-ins offer a supportive environment and surprisingly effective peer pressure, turning the usually solitary act of writing into a community experience. With NaNoWriMo’s Young Writers Program, that community crosses age boundaries into K-12 classrooms around the globe. The YWP allows kids and teens to set their own word-count goals, and offers educators high-quality free resources to get nearly 100,000 students writing original, creative works. Although the event emphasizes creativity and adventure over creating a literary masterpiece, more than 90 novels begun during NaNoWriMo have since been published, including Water for Elephants by Sara Gruen, The Night Circus by Erin Morgenstern, and Cinder by Marissa Meyer, all #1 New York Times Best Sellers. 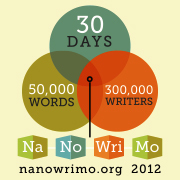 For more information on National Novel Writing Month, or to speak to NaNoWriMo participants in your area, visit www.nanowrimo.org. I agree, Victoria — any effort at all produces pages that you wouldn’t have had otherwise. Good luck!